I'm obsessed! I have loved Michael J. Fox my whole life...watching him on Family Ties, and who can forget Teen Wolf? 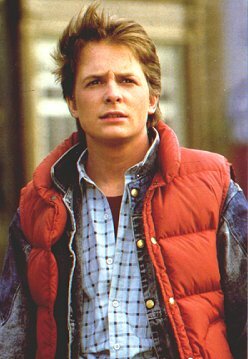 ?The Back to the Future trilogies are among my favorite movies of all time, and I never tire of watching them, no matter how many times I have seen any of them. I saw parts II and III in the movie theater, and was completely overwhelmed! 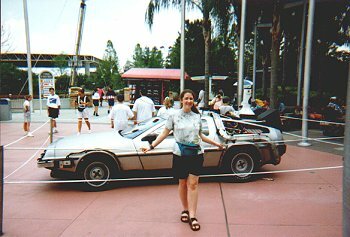 One of the greatest things for me was during my senior class trip to Universal Studios and Disney World, I was able to see the DeLorian and ride the Back To The Future ride!! My best friend and I rode on it four times in a row, which I wouldn't necessarily recommend because it's a lot like head-banging...It was AWESOME! I have no idea why so many people think the second movie is so confusing. 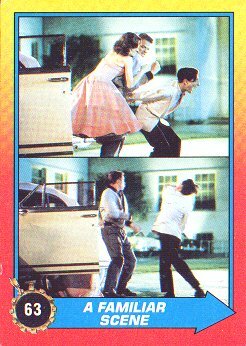 Anyway, here are the following images are taken from my collection of BTTF bubble gum cards, purchased at Kay Bee toy's when the movie came out! They are all from BTTF II! This is what the cards look like on the back! What a far-out future! 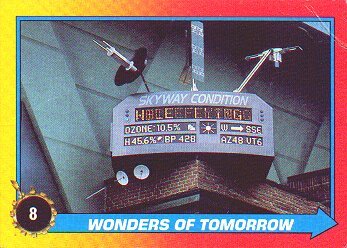 Double-level gas stations, robotics shops, air traffic control systems...! 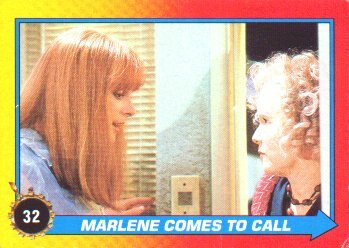 "You can't risk running into your furture self," the Doc warns Marty. "If that were to happen, the encounter could cause a time paradox, the results of which could cause a chain reaction that would unravel the very fabiric of the space-time continuum and destroy the entire Universe!" 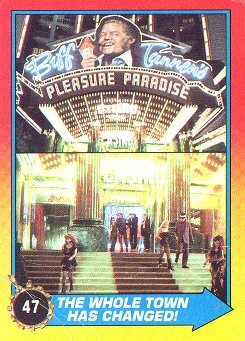 In the center of Hill VAlley town square, Marty is stunned to find that the courtnhouse is now a huge casino hotel..owned by none other than Biff Tannen! 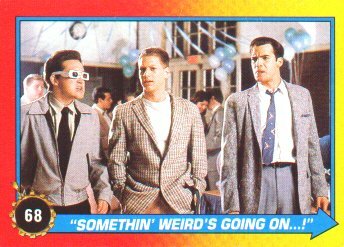 With Biff gone, Marty tries to make sense of all that's happened. When he asks his mother why she left George McFly, and where he is, she tells him, "Where he's been for the last twelve years-Oak Park Cemetery." 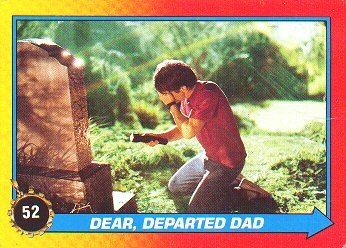 Anguished Marty McFly visits the grave of his dad, George, who's been dead twelve years. 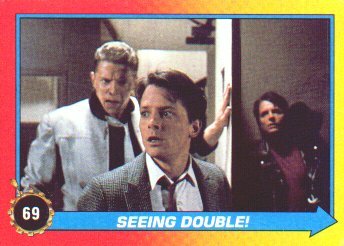 Biff's goony gang members are confused by the appearance of Marty McFly in different places at the same time! 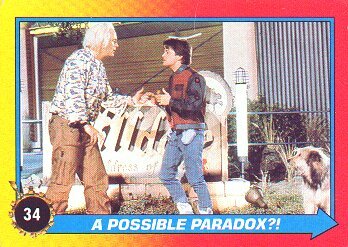 Before he is able to get away from Biff, Marty is knocked out by his other self rushing out of the school in order to meet Doc Brown. 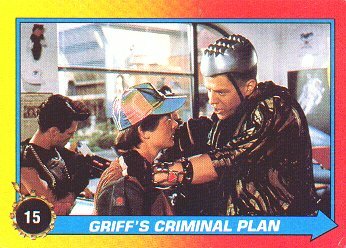 Biff gets the almanac back. 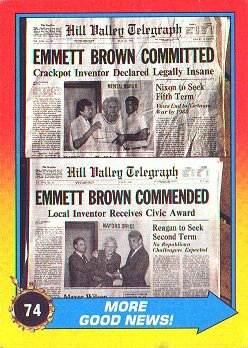 With a sigh of relief, Marty watches the newspaper headline about Doc Brown being committed change into a similiar headline, which has the Doc being "commended". All is well...or is it?? As a major s torm approaches, a bolt of lightening strikes the DeLorean, causing it to disappear. 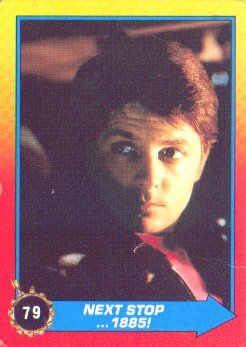 Then, out of the darkness, a strange man appears looking for Marty. 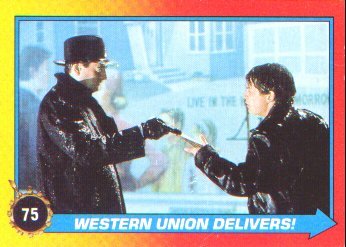 He turns out to be a Western Union man with a mysterious letter addressed to Marty McFly..
Next stop, 1885, Part III of the trilogy!! 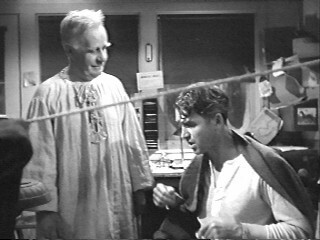 Sometime during college, I have to write a paper on the connections between BTTF and It's a Wonderful Life, also one of my favorite movies of all time. 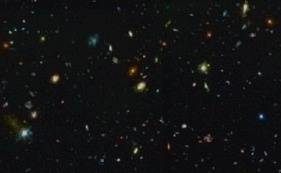 There's something there. It would be a great thesis. I'm not exactly sure what it is theme-wise..but both take a look at what could have been and what could be. The Hill Valley Telegraph! News on beloved actor Michael J. Fox, BTTF Trilogy, merchandise etc. Skippy's BTTF page: Everything you wanted to know about the Back To The Future Trilogy but had too little time to ask!" I pity the foo who doesn't visit Mr. T vs. BTTF! If you have a Back to the Future page and would like to have it on this list of links, please e-mail me!! This web page is for entertainment purposes and not in anyway intended to infringe on copyrights. 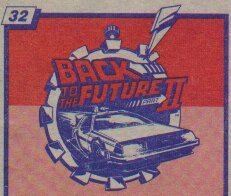 The Back To The Future logo is a registered trademark of MCA Universal & Amblin Entertainment.